VPX Redline Energy Drink is a powerful blend aimed at assisting fat loss in bodybuilders. Redline comes in many forms including RTD, Xtreme, Redline Liguid Caps and varies in caffeine by type/flavor. Above is the caffeine amount of their Standard RTD variety although some flavors can have a little more or less caffeine. We also have Redline Princess listed as well as Redline Energy Shots listed in our database. 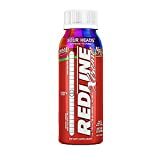 At on time pure Redline liquid was for sale and contained 250mg of caffeine in a single teaspoon, but this has been since discontunued due to health concerns. 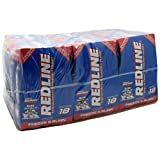 NOTE: Redline is a powerful drink -- not just because of the high levels of caffeine but due to the synergistic effects of all the ingredients combined. This drink is aimed specifically at BodyBuilders and the label recommends only trying half a can at a time. You can read more discussion about this here. Evoburn (Pure Evodiamine), N-acetyl-tyrosine, Yerbe Mate, Green Tea, 5-hydroxy-L-tryptophan, CAMP (adenosine cyclic 3',5'-monophosphate), Vinpocetine, Yohimbine HCL. Highly Purified Water, Citric Acid, Carmine Red, Liquid Red, Sucralose, Potassium Sorbate, Natural and Artificial Flavor and Natural Colors. How Does Redline Energy Drink Compare? Redline Energy Drink contains 31.25 mgs of caffeine per fluid ounce (105.67mg/100 ml). Manufacturers website http://www.vpxsports.com/ Other details via UCSF school of pharmacy.